George is your local Brighton Building Consultant. • Asbestos Inspection and Testing. An interest in the building trade from his youth set him on the career path that he’s still passionate about today. 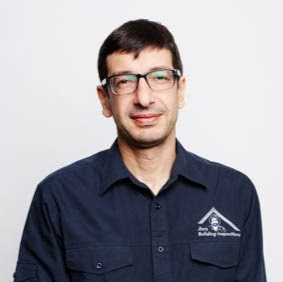 After studying an Advanced Building Construction Course, Georges’ career begun in 1988 as a Cadet Building Surveyor with the City of Kew, where his role included onsite inspections and checking building applications. He moved onto to become a registered builder and held the position of Supervisor at a house restumping firm. His role as a supervisor lead George to gain numerous skills and a wealth of knowledge regarding various housing structures in the suburbs of Melbourne. For the last 12 years, George has successful operated a Cabinetry business, specialising in manufacturing and installation of kitchens. His latest venture of joining Jim’s Building Inspections arises from his passion of building and to continue servicing customers in this new role, where quality and professional advice can be expected. George has been a resident in the Bayside area all his life. His love of the beach and the local area, were major reasons for him and his wife wanting to remain and raise there family. George is looking forward to assisting you with any future endeavours relating to your current and future properties.